The Hills SupaFold range is widely considered to be the finest collection of folding frame clotheslines in the world. The ultimate in folding frame design, SupaFold is for those whose space is at a premium or simply prefer a wall mounted line to a traditional rotary model. Stylish and robust, the SupaFold Mini folds neatly against the wall when not in use. 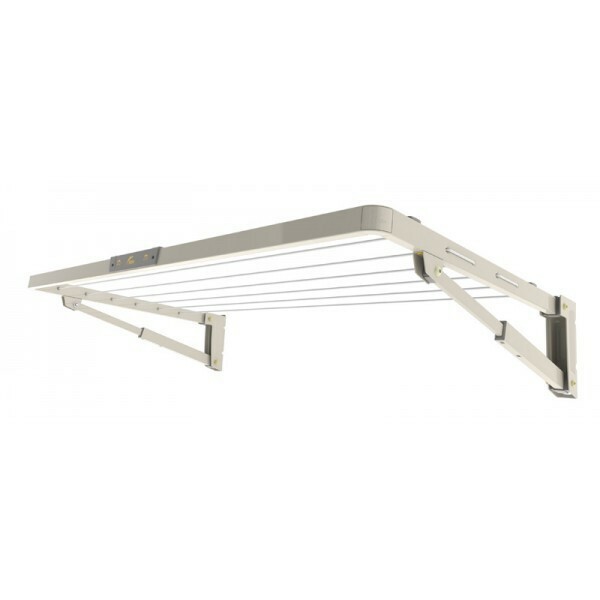 Hills wall mounted folding frame washing Lines are compact and stylish for Indoor and Outdoor Clothes Airing & Drying. Hills Brand Leading 10 Year Guarantee. Robust, durable and aesthetically pleasing, the SupaFold Duo washing line will not just enhance your garden but ensure that your clothes look better, smell better and last longer. Line drying versus tumble drying is great for the environment and will save you money as well. Hills Washing Lines UK, the Original and Official Hills legendary washing Lines, Quality Washing Lines - The Genuine Aussie Article! Since 1946 Australian designed and manufactured Hills Washing Lines have been made using the finest materials, each Hills clothes line style is engineered to give you and your family many years of trouble free, faithful service. Each product comes with an industry leading 10 year peace of mind waranty against defects. We would like to wish you a very merry Christmas and a happy New Year from everyone and MAD4TOOLS.COM. Please be aware that whilst we will be open every business day of the Christmas period (excluding Monday the 24th of December) due to courier closures and supply chain closures orders placed from 1200hrs on the 19th of December 2018 may not reach you until the end of the first week of January 2019. We will be processing orders every business day during the Christmas period though orders placed after 1200hrs on the 19th of December 2018 may not be dispatched until the 2nd of January 2019. We will be Closed: Monday 24th December 2018. You can select from 2 different delivery services; standard, next day. The charge for each service is dependent on your total order value. See table below. *Premium delivery options not available for 2-5 Day & other zones. The Other zones option is for UK only postcodes: AB36-AB38, IV36-IV49, HS1-HS9, IV51-IV56, PA41-PA49, PA60-PA78, PH42-PH44, KW15-KW17, ZE1-ZE3. NOTE: Please also note that some large and/or heavy items may be more expensive to 2-5 Working Day & Other zones delivery addresses. Delivery time estimates stated are for working days (Mon - Fri). Please allow 5 working days for standard delivery. We cannot offer delivery to BFPO address's. IMPORTANT: PLEASE ENSURE YOU REPORT ANY DAMAGE OR SHORTAGES WITHIN 3 DAYS OF RECEIVING YOUR DELIVERY. MAD4TOOLS.COM provide an exceptional personal and custom international delivery service. Whether you want just one small order delivered to the other side of the world or a consignment of pallets, we can provide a delivery service fully insured and trackable to suit your needs. We offer delivery services to countries all around the world, though due to the varying nature of product weights, dimensions and delivery services we invite you to contact us for a personal and custom delivery quote for your specific order delivered abroad. Please make an enquiry for your international delivery using the below methods of contact and include what it is you are looking at ordering (including quantity) and your full delivery address including Zip/Postal code where applicable. Send an enquiry using our online contact us form. Please consider that if you are having the goods delivered to a country in the EU then UK VAT rates apply and if you are having the goods delivered outside the EU then UK VAT does not apply, though this is only the case if we deliver the goods outside the EU or have onward shipment proof of the goods leaving the EU. NOTE: for deliveries outside the EU you will have to pay your countries import duties, taxes and any handling charges. It is your responsibility to find out what these are prior to ordering and your responsibility to pay them. All countries are different on these taxes, duties and handling charges. Some products we are not able to send abroad due to transport, import and export restrictions. In the event you make payment and want to cancel your order the transaction will be subject to a 10% payment value cancellation fee as well as the deduction of all costs incurred by Mad Supplies Ltd if greater than 10%. Any bulk orders being produced to a customers requirements and orders including custom printing are not possible to return or cancel the order after payment being received, subject to these payment terms. In the rare situation that goods are found to be materially faulty, they will be returned from the delivery address and replaced. No goods will be reserved or held for you until payment has been received or confirmation of payment being sent has been provided. Order before 1.00pm weekdays and we can dispatch your order for next working day delivery. Alternatively you can choose a delivery slot up to 7 days in advance. Does not apply to direct dispatch products or customers living in 2-3 Day and other Zones. We´ll deliver direct to you, to your customer or to site. It´s easy to add another delivery address to your account, just select deliver to a different address when you´re checking out. Items marked 7, 14 or 21 working days are dispatched direct from the supplier. You will be contacted direct by the supplier to arrange a delivery date - Monday to Friday only. Note: Direct Dispatch items cannot currently be tracked. Most Big Stuff/Direct Despatch items can only be delivered to an external ground floor location at the delivery address. A signature will be required upon delivery. If so, please contact us to get more information. Once your item has been dispatched you will receive an email confirming this. We use a selection of different couriers to suit the requirements of the varying weight, dimensions and delivery locations and services required for each order and as such it is not always possible to provide a tracking number for deliveries, though where possible the courier's details and your consignment number will be included in the dispatch confirmation email. If you require an update on the progress of your delivery and courier and tracking information was not included in your dispatch confirmation please allow up to 4 days for the package to arrive unless you selected a premium delivery service and then contact us for a delivery update. NOTE: Items marked 7, 14 or 21 working days cannot be tracked as they are dispatched directly from the supplier. Please do not schedule or start any installation work until after you have received your order and checked all goods for any defects or missing parts. This will enable you to resolve any technical questions or to order specific additional fittings, if needed. If you have any questions please call our customer service team on 01179 780 174. Under our 30 Day Money Back Guarantee you can return unwanted goods. Items should be unused, in a saleable condition, with their original packaging and with all component parts and any promotional items received. You should include your invoice and a completed returns form. Certain items are excluded from the guarantee. These include (but are not limited to) goods that are made to measure, cut or mixed to your requirements, custom printed. Other excluded items are macerators and water pumps. Send it back via your local Post Office - click here for a Returns form. Send it back via a Courier Collect service - Collections are on week days from 8.00am to 6.00pm, for more information call our customer service team on 01179 780 174. Post Office return is not available for items over 1.5m in length or 4kg in weight. For these items please use the Courier Collect Service by calling or emailing our customer service team for further advice. For products delivered directly from our suppliers, please call our customer service team. If you notice any damage or shortages on your goods then we need you to inform us within 3 days of taking delivery. We would recommend refusing any delivery that looks damaged or making note of any damage to the box when signing for your delivery. If you have notified us of any Damage or Shortages with your goods within 3 days of receiving your delivery, we will either make good any non-delivery; replace or repair any goods that are damaged or defective upon delivery; or refund to you the amount paid by you for the goods in question. If you purchased the item less than 30 days ago you can return it under our 30 Day Money Back Guarantee and we will refund you the postage you paid to return the item or if a courier is required then we will arrange this at no cost to you. Please make sure that you return all component parts and any promotional items received. You should include your invoice and a completed returns form. Please ensure that all petrol products are drained of fuel and oil before return. If the item has already been installed, call us on 01179 780 174 for further advice. If you purchased the item more than 30 days ago our aim is to get the problem put right as quickly as possible. In most instances, relative to the product in questions warranty, we will either offer a repair or where this is not possible we will replace the item with the same or an equivalent model. Check if the manufacturer offers a helpline, repair or warranty service. Using this service may be the fastest way to get the problem put right. Call us on 01179 780 174 to arrange a FREE carrier pick up. Please remember to include your invoice, returns form and ensure that all petrol products are drained of fuel and oil before return. If the item has already been installed, call us on 01179 780 174 for further advice. A cancellation can be made up to 30 days from point of order via phone, email or mail (MAD4TOOLS.COM, Unit 16, Kenn Court, South Bristol Business Park, Roman Farm Road, Bristol. BS4 1UL). NOTE: Certain items are excluded from this, these include (but are not limited to) goods that are made to measure, cut or mixed to your requirements, custom printed or other possible exclusions include macerators and water pumps.